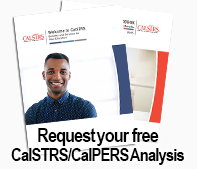 To gain an accurate understanding of the status of your CalPERS or CalSTRS Retirement benefits, please complete the form below. We take a look for you, and provide you with a clear and up-to-the-minute report on your retirement benefit. Upon clicking these links, you are leaving this website. The website you are going to is not controlled by the companies of OneAmerica or The Sterling Insurance & Financial Group and the content thereon has not been reviewed or approved by the companies of OneAmerica or The Sterling Insurance & Financial Group. The companies of OneAmerica or The Sterling Insurance & Financial Group are not responsible for any information on these pages.